According to the Scotland Office's 'Scotland Environment Statistics' for 1998, 62 species of mammals are found in and around Scotland. Of these 48 species breed on land. Several species are in currently danger due to a reduction in their habitat. Scotland holds the entire British population of the Orkney vole (1,000,000), reindeer (80) and wildcat (3,500). Scotland's present 'native' animals began to colonise the country as the summers became warmer. There were several large predators including the brown bear, the wolves and the Northern lynx but these are all now extinct. Eight species of mammal have become extinct in Scotland, all because of man, since the 10 th century. Under European Union legislation, the government is required to investigate the possibility of reintroducing indigenous but now extinct species (article 22, EU Habitat and Species Directive 1992). Several species have been discussed for re-introduction, including the wild boar, the wolf and the lynx, however it would appear that it is the beaver which will be the first extinct Scottish mammal to be reintroduced since the Reindeer in 1952. Species Latin name Date of extinction Reintroduced? Northern Lynx Lynx lynx After 2 nd or 3 rd century I beleievd the lynx was exterminated by Neolithic Man. However, Dave Hetherington points out "This was for a long time thought to be the case but recent radio-carbon dates from a skull found in a cave near Inchnadamph yielded a date from around the second or third century AD. This specimen was very unlikely to have been the last lynx in Scotland, so it is fair to say we don't really know exactly when it became extinct but it was certainly in historical times, most likely in the Dark or Middle Ages." Reindeer Rangifer tarandus 12 th century There were failed reintroduction attempts in 18 th century at Dunkeld, in Orkney and the Forest of Mar. Successfully reintroduced between 1952 and 1961 in the Cairngorms. There are three herds totalling 70-80 individuals. Elk Alces alces Around 1300 ? The Bas Dhairmid (Death of Dermid) of around 1300 includes the lines 'Glen Shee, that glen by my side, Where oft is heard the voice of deer and elk. No plans to reintroduce. Red Squirrel Sciurus vulgaris about 1810 Reintroduced to Midlothian in 1772 and Perthshire in 1790. Reindeer were re-introduced starting in 1952 and now number 70 - 80 individuals. The polecat was reintroduced but is believed to have become extinct once more. Beaver have been reintroduced unsuccessfully on at least two occasions, and there are further plans to reintroduce them. A feasibility study was carried out by Scottish Natural Heritage. The plan is being resisted by some who claim that beavers have been extinct in Scotland for almost 500 years and reintroduction is equivalent to introducting an alien species. There have also been extensive talk of reintroducing the wolf to Scotland although Scottish Natural Heritage says it has no plans undertake feasibility work. A pilot study was proposed by the Cambridge-based 'Highland Wolf Fund' but failed to raise enough money for this to be carried out. 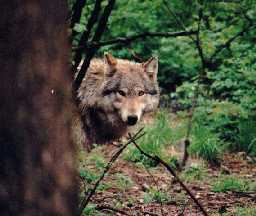 Some claim that wolves have already been reintroduced secretly. Huge numbers of lynx, wolves, bears and wild cats prowled the forests of Stone Age Britain, according to the first snapshot of wildlife populations of 7,000 years ago. Bears numbered up to 14,000, lynx about 5,000 and there were more than two million wild boar. The figures, compiled by Dr Derek Yalden, of the University of Manchester, show the numbers of mammals inhabiting Britain before they were hunted to extinction and their habitat destroyed. His statistics are based on evidence gathered from ancient woodland in the Bialowieza national park, in Poland, which is still home to red deer, wild boar, elk, wolves and lynx. The woodland is the closest surviving example of the kind of environment existing in Britain in the middle Stone Age. Dr Yalden, president of the Mammal Society, said: "We already have information on what the vegetation was like, so it seemed to me it could be possible to come up with the same sort of details about mammals. "It was basic scientific curiosity really, but I thought it would be interesting to see what the populations were like then." In the middle Stone Age, fewer than 2,500 people lived in Britain, much of which was covered in wood and grassland. But there were estimated to be up to three million red deer, compared to 350,000 today, up to 7,000 wolves, which are now extinct in the wild, and up to 8,000 wild cattle, called auroch. Elk probably numbered more than 90,000, beavers up to 25,000 and there were "hundreds of thousands" of wild cats, said Dr Yalden. The populations are thought to have existed between 5,500 and 9,500 years ago, before forests were cleared and the animals hunted. Lynx are thought to have died out in Britain in the year 300, bears between the eighth and 10 th centuries and wild boar in the 17 th century. The last wolf was believed to have been killed in Britain in the late 17t h century. Dr Yalden said yesterday it would be "natural progression" to try to reintroduce some of these animals. He said: "If we used to have these animals here, should we be considering putting any of them back?" Dr Yalden said if the reintroduction of beavers into Britain were to work, a move being considered by Scottish Natural Heritage, it might provide the impetus for further attempts with other animals. Dr Martyn Gorman, senior lecturer in zoology at Aberdeen University and vice-chairman of the Mammal Society, said there was a "moral" obligation to reintroduce wolves to the Highlands to help control numbers of red deer.